Disney Infinity fans are still coming to grips with last week’s unexpected cancellation of the toy-based videogame series. A victim of extreme expectations, Disney Infinity is being shut down because the second and third toy lines, which consisted heavily of Marvel Comics and Star Wars content, failed to hit overly optimistic sales projections. Kotaku reported that unsold inventory helped kill the project—supposedly Disney made two million Hulk figures, and were only able to sell half that number. If you kept an eye on the Disney Infinity sections at stores it’s not that surprising—shelves were always stocked heavily with 2.0 and 3.0 figures, and some of the older 2.0 releases started popping up on the clearance rack at Target and other stores well before the cancellation was announced. Sales might have been good (it’s estimated the Star Wars-themed 3.0 racked up over $200 million last fall) but they weren’t good enough, and instead of trying to reassess plans Disney decided to cut bait, cancel the project, write down $147 million in losses and completely exit the console game publishing business. This a huge bummer for Infinity fans, for a number of reasons. A major part of the game is creating and sharing toy boxes with other players. With the game going away, and developers Avalanche Software being shut down, it’s only a matter of time before Disney closes the servers that keep the online portion running. Players might be able to still make toy box levels and games, but other players won’t be able to download them anymore. Toy box editors also have no new in-game tools and toys to look forward to—the options available to them in the game now are all that will ever exist. A dedicated community of toy box makers and players is staring down obsolescence a lot sooner than any of them imagined. The greatest loss, however, might be potential. Players are used to a regular stream of new characters and play sets, and that will come to an end after the next two round of releases in May and June. We’ve learned some of what was planned for Disney Infinity over the rest of 2016 and 2017, and it hurts to know these will never come to pass. And beyond specific concepts like those lies the possibility that was always a major part of the game’s appeal. It promised us playable versions of some of the most beloved and iconic characters in pop culture, and between Disney, Pixar, Marvel and Star Wars it was able to appeal to the nostalgia of every generation currently living. Toys and play sets might have been too heavily skewed towards recent projects—somehow the dozens of figures released include an Armie Hammer Lone Ranger and Good Dinosaur’s cave boy, but not Goofy or Pluto, and only a few characters from animated features and shorts released during Walt Disney’s lifetime. Between the optional power discs and the virtual toys available within the toy box, though, Infinity condensed nearly 90 years of entertainment history into a single game with some of the most accessible game-creation tools ever made. There were still legions of characters and worlds that the game hasn’t been able to touch on, from throughout the wide range of Disney properties, and now the game never will. We don’t want to wallow, but there are dozens, perhaps hundreds, of Disney-owned characters that deserved their own Infinity figures, and here are some of the most glaring omissions. Fans of classic Disney animation sometimes refer to Mickey, Minnie, Donald and Goofy as the big four. (Sorry, Pluto.) Goofy is the only one of the four to never be released as a Disney Infinity figure. He’s available in miniature form as a non-playable townsperson, and as an AI sidekick in 3.0, but he’ll never be playable in game or have a figure to take its rightful place on the shelf alongside Goofy’s cartoon friends. The official corporate brand of “Disney Princesses” might be obnoxious, and surprising from a company that had an official rule against making fairy tale adaptions for 30 years, but the marketing is clearly successful, and the movies the princesses come from are among the company’s most important and beloved. Disney’s versions of Snow White, Cinderella and Sleeping Beauty are all timeless characters, as popular today as any of the princesses from recent films. If you don’t believe us, go walk around a Disney theme park and see how many girls are dressed as Snow White or Aurora, and how long the meet and greet lines can get for these three. None of them have a Disney Infinity figure, though. Even more recent princesses like Ariel from The Little Mermaid and Belle from Beauty and the Beast are missing. You might think it’s because toy companies and game publishers notoriously avoid female characters, but Disney Infinity never reflected that attitude, at least not with its Disney and Pixar lines. Somehow, though, there were no figures for any princess that predates Jasmine from 1992’s Aladdin. As with so much of modern Marvel marketing, this comes down to the ever-fractious relationship between Marvel and 20th Century Fox, the film studio that owns the rights to the X-Men. Wolverine has been one of Marvel’s two most popular characters since the 1980s. If you look at Marvel merchandise from the late ‘80s through 2011 or so, the only character you’d see more than Wolverine is Spider-Man (who had his own play set that launched alongside 2.0 and a second figure released this year). One of Marvel’s most visible characters, one of the two main lynchpins of their advertising for decades, is completely absent from Disney Infinity, and probably because Marvel now goes out of its way to not promote the properties that Fox owns the film rights to. This extends to the entire line of Marvel mutants, basically every character that debuted or can be connected to the X-Men throughout its complicated 53-year-history. If you got into Marvel in the late ‘80s or early ‘90s and wish you could play Disney Infinity as Rogue or Colossus or Jean Grey, you will be always out of luck. Every major hero from the Captain America: Civil War film is available for the game, except for the Scarlet Witch, War Machine and Winter Soldier. A Winter Soldier figure has been heavily rumored since Marvel was introduced into the game with 2.0, but we now know it’ll never arrive. You can argue that War Machine and Winter Solder would be too similar to other characters already in the game—there are already two Captain America figures and two Iron Man figures (if you count Hulkbuster), so from a playstyle perspective these two maybe wouldn’t bring much new to the table. Still, they’re crucial parts of the Marvel Cinematic Universe, and clearly a lot of fans would love to play as them. The Scarlet Witch, though, is a genuine missed opportunity. She’d have a unique look and feel within the game, and bolster the too-small female roster of the Marvel line. Too bad she couldn’t adjust these probabilities and keep Infinity alive. A handful of villains muscled their way into Disney Infinity: Darth Vader, Ultron, Tentacle Faced Ian McShane, that guy with the orange hair from The Incredibles, and a few others. They make up a very small percentage of the total line, though, and other than Maleficent, which is based on the antihero version from the Angelina Jolie film and not the original Sleeping Beauty heavy, none of them come from Disney animated features. We could’ve used an Ursula, an Evil Queen, a Stromboli or a Jafar. Cruella de Vil is one of the most vivid villains in the history of pop culture, and the closest she gets to making an appearance is as another background townsperson and through a power disc for her car. Disney’s been heavily marketing its bad guys as of late—stores at the parks are full of shirts with Ursula, Maleficent and others—so it’s surprising they never attempted to fit them into this game. And there are still many established Marvel and Star Wars villains that could be roped in, from Captain America’s Red Skull and Crossbones, to upcoming film villains like Baron Mordo and Dormammu, to such Star Wars foes as the Emperor, Count Dooku, Captain Phasma and more. Disney will continue pumping out two or three Marvel movies a year as long as they keep making uncomfortable amounts of money, and we already know what’s scheduled to hit theaters for the next several years. Disney Infinity fans have been treating it as a given that we’d eventually get figures based on Dr. Strange, the Wasp, Captain Marvel, Thanos and more, and now that won’t be happening. All the Marvel heroes in the game are based on their movie or cartoon versions. Marvel has decades of comics that could be drawn from, though, with a number of important characters that haven’t made much of an impact on screen yet. On the Avengers front, you’ve got characters like She-Hulk, Hercules and Wonder Man who’ve been members of the group for decades. If the Netflix versions of Luke Cage and Daredevil are too adult for a kids’ game, you can look to the less intense comics as inspiration for those two. (The fact that we got an Iron Fist figure without a Luke Cage is another one of those weirdly shocking things about this game.) Ms. Marvel, Squirrel Girl and Hellcat all star in popular comics right now, and are starting to make inroads into Marvel’s animated and mobile game offerings; their highest profiles might still be on the page, but they still would’ve been great additions to Infinity. Disney Infinity did a solid job of incorporating recognizable landmarks from Disney’s theme parks into the toy box mode (I’m pretty sure the It’s a Small World building from Disneyland has wound up in every toy box I’ve ever made), but it almost completely overlooked the unique characters introduced in the parks. The Haunted Mansion could’ve supported an entire play set, with figures for the Hitchiking Ghosts, the Black Widow Bride and the newly revived Hatbox Ghost. There was an entire run of Pirates of the Caribbean figures, but they were all based on the live action movies and not the ride. Ride-specific Pirates figures wouldn’t have made a lot of sense (although that skeleton pirate at the wheel of the ship during the storm would’ve made for an amazing-looking toy) but power discs that change your toy box’s theme to match the Pirates ride instead of the moves would’ve been nice. Figment, the imaginary dragon from Epcot, probably could’ve been a cult favorite figure, too. We’re talking Pluto, Daisy Duck, Chip and Dale, Pete and maybe even relative obscurities like Horace Horsecollar and Clarabelle Cow. They may not be as vital as Goofy (again, sorry, Pluto) but the game probably would’ve gotten to at least those first four eventually. If you’ve ever looked at any Infinity fan forums, you’ll know that Darkwing Duck was one of the most requested figures. DuckTales might be a better fit for that late ‘80s / early ‘90s syndicated cartoon nostalgia—its core characters of Scrooge McDuck and Huey, Dewey and Louie are better known than Darkwing Duck, and its loose appropriation of classic Carl Barks comics gives it a stronger sense of place and story for a possible play set. But Tail Spin, Goof Troop or Chip ‘n Dale’s Rescue Rangers could all have worked as a way to get older characters in the game with a slightly more modern approach. Baloo and Sorcerer’s Apprentice Mickey are the only two Infinity figures based on Disney animated features older than 1992. Sleeping Beauty’s Maleficent and Tinker Bell are playable in the game, but they’re based on 21st century versions adapted for the Angelina Jolie Maleficent movie and the Disney Fairies line of toys and movies. 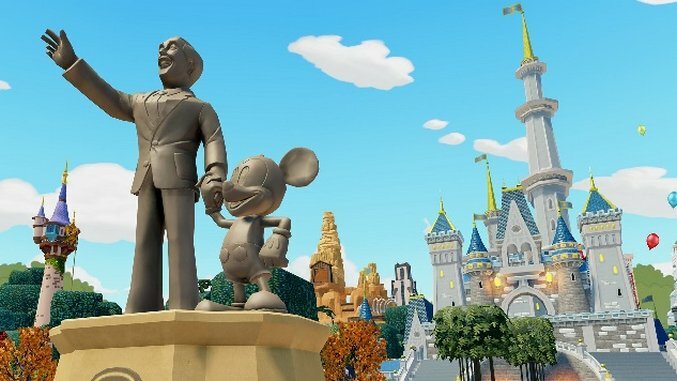 Disney’s animated classics are some of the most beloved movies ever made, and an enduring cash cow for the company, but outside of power discs their presence in Disney Infinity is limited. A Peter Pan was in the works after winning an “artist’s choice” poll at the 2015 Toy Box Summit, but it’s been cancelled. Pinocchio, characters from the animated Alice in Wonderland, Ichabod Crane, Arthur and Merlin from The Sword in the Stone, Robin Hood and more all would’ve been welcome additions. Probably the only reason that Disney didn’t release an Indiana Jones figure is because the character doesn’t fit under any of the Disney, Pixar, Marvel or Star Wars brands. A full Indiana Jones line would be a huge stretch—you could do him, his dad, Sallah, Marion Ravenwood, maybe Short Round or Marcus Brody, and a few one-off bad guys who invariably die in the end, but even those last few would feel pretty unnecessary. Indy himself is a clear no-brainer for the game—he’s already basically a videogame superhero as it is, and the exotic settings of his films would add a lot of great content to the toy box mode—but Disney Infinity was built in part to market specific brands, and Indiana Jones just doesn’t fit the kind of scale they were targeting. He exists on his own, relatively small island within the massive Disney universe. It sounds like Disney Infinity was at least slightly moving away from the sweeping brand-based divisions, if rumors about a story mode that incorporated all its corners are true, so perhaps an Indiana Jones play set would’ve been possible in 2017. Too bad that’ll never happen now. Disney’s already basically turned him into a cartoon character at this point, so it would only be right to stick him in a game with a few of his creations (and like 90 other characters that didn’t exist in his lifetime).